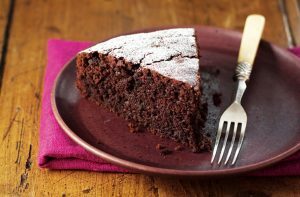 This delicious sweet treat by Martha Stewart is a perfect way to use up any beets you may have in your fridge. You can’t taste the beets, but they add a nice pink-red hue to the cake. Cover beets with water in a pot. Bring to a boil. Reduce heat, and simmer until very tender when pierced with the tip of a sharp paring knife, about 30 minutes. Drain the beets BUT SAVE THE WATER. Puree beets in a food processor until smooth. Preheat oven to 350 degrees. Whisk together flour, sugar, cocoa powder, baking soda, and 3/4 teaspoon salt in a large bowl. Whisk in eggs, water, oil, vanilla, and 1 1/4 cups beet puree (reserve remaining puree for another use). Coat a 9-inch round cake pan (3 inches deep) with cooking spray. Line bottom with parchment, and coat with spray. Pour batter into pan. Bake until a toothpick inserted into the center comes out clean, about 45 minutes. Let cool in pan on a wire rack for 20 minutes. Turn out cake from pan, and discard parchment. Let cool completely, right side up.